A web application server to run the FME Server Web Services. You can run the FME Server Web Services on your own servlet (Apache Tomcat and Oracle WebLogic are supported), or use an Apache Tomcat servlet provided with the installation. A database server to host the FME Server Database (Oracle, PostgreSQL, and SQL Server are supported). A remote file system to host the FME Server System Share, which includes Repositories and Resources. 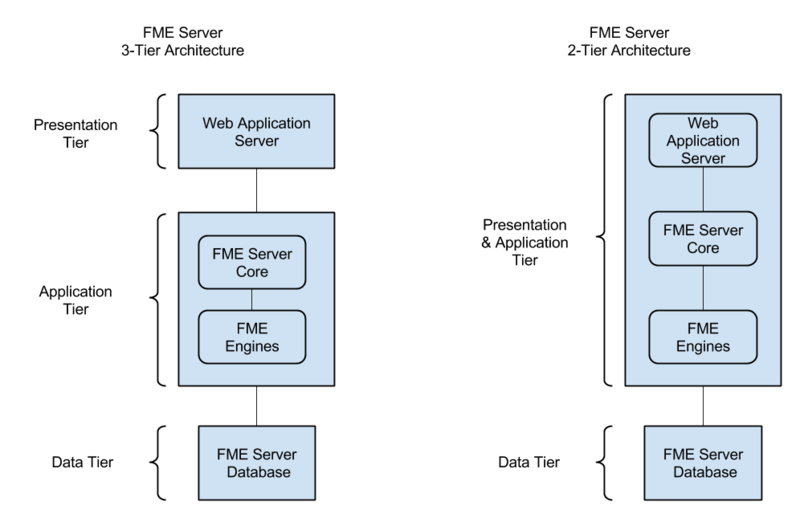 In a 2-tier architecture, an Apache Tomcat servlet is provided to run the FME Server Web Services, and is installed along with the FME Server Core and Engines. Only the FME Server Database is installed separately, on a server you provide, along with a remote file system. Distribute components if you want to keep them separate so that each can be managed by the appropriate expert team.